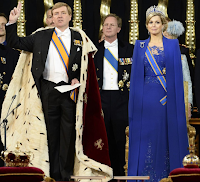 After 123 years, the Netherlands has a king, - Willem Alexander, who acceded to the Dutch throne and the headship of the royal House of Orange today upon the abdication of his mother, Queen Beatrix. She had been the third in the trio of Dutch Queens to reign in the Netherlands since 1890. The first of those three, Queen Wilhelmina, was one of the great symbols of wartime resistance to Hitler. Along with King Haakon of Norway, Charles DeGaulle of France, and Winston Churchill, she chose not to be on what then appeared to many to be "the right side of history" in 1940"). King Willem Alexander's grandmother, Queen Juliana presided - tearfully - over the independence of Indonesia and the effective end of the Dutch Empire. In its time, however, the Dutch Empire had once mattered on the larger world scene. Reminders of that are the orange bar on the flag of New York City (an acknowledgment of the Dutch role in the founding of one of the world's greatest cities) and the orange stripes on my academic gown (a celebration of the Dutch royal house, the House of Orange, and its pivotal role in England's "Glorious Revolution" of 1688, which ousted that country's last Catholic king and solidified the supremacy of Parliament over the monarch). 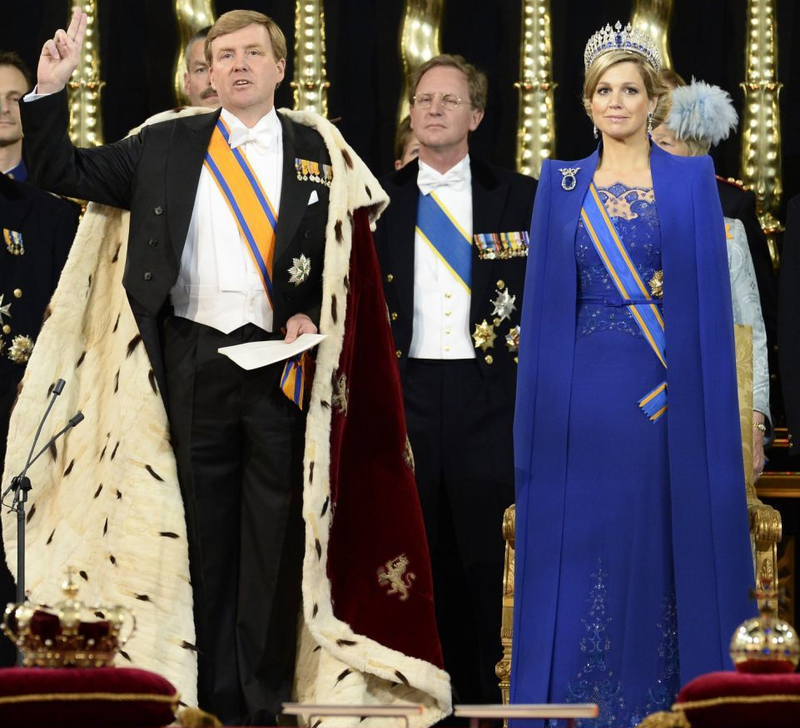 King Willem Alexander's wife, Queen Maxima is an Argentinian by birth. It's been a good year for Argentina so far! The House of Orange links the modern Netherlands back to William the Silent's 16th-century revolt against Catholic Spain. By royal standards that's a short span of history. Some other reigning houses boast a longer lineage and link their 21st century peoples back a thousand or more years. It is one of the functions of royalty to connect and bind. Obviously the connection back to the nation's past binds a people to their heritage and is an important value in itself. But royalty also connect and bind their people in the present. Commenting on the recent British funeral of Margaret Thatcher, someone questioned the propriety of so much state ceremonial for a mere politician - the argument being that, unlike royalty, whose role is to unite a nation, politicians divide it. In today's world, perhaps an additional symbolic function of royalty is that kings and queens do not choose their jobs, but receive them as a civic calling, a secular vocation. That makes royalty a wonderful witness to the value of a life focused on something bigger than oneself, something so ncessary for civilization but so unvalued in today's world. Tomorrow, the Church commemorates Pope St. Pius V (1504-1572), the Dominican pope who reigned from 1566 to 1572 and who was tasked with implementing the liturgical reform called for by the Council of Trent. This he did with the publication of the Breviarum Romanum in 1568 and the Missale Romanum in 1570. These were not innovations but for the most part careful editions of the Roman Rite as it had evolved over the centuries and been diffused throughout much of the Latin Church. In addition to standardizing the Roman Rite itself in a precisely printed Missal and Brevary, Pius sought also to standardize the Latin liturgy in general by mandating the use of the new Roman liturgical books everywhere in the West and by everyone (religious orders included), except those places and communities already in possession of rite more than 200 years old. Thus, this standardization left untouched the Monastic Breviary used by Benedictines and Cistercians, and the liturgies of such ancient sees as Milan, Lyons, and Braga, and of religious orders like the Domincans, the carmelites, and the Carthusians. These diverse liturgical regimes remained in place until a new standardization took place in the wake of the post-Vatican II liturgical reforms. Fifty years after Sacrosanctum Concilium opened the floodgates to liturgical experimentation, that more recent reform remains still controversial. There are fanatics on both sides - extreme traditonalists who cannot abide anything about the reforms of Paul VI and extremists on the other side who totally denigrate the liturgy of the centuries. Both positions are somewhat absurd. Not only were generations of faithful Catholics and saints formed and spiritually nourished by the 1570 Missal, so of course were the Vatican II Bishops who voted to make certain reforms in the familiar rite. It was the Mass according to the 1570 Missal, which was celebrated at the opening of the Council and (somewhat modified) at its close. Having been basically formed in the old rite and having then lived through the trauma of liturgical change and experimentation, and recognizing how the persistence 50 years later of the liturgical wars in some sense reflects larger socio-cultural wars, I have come to a few modest conclusions about it all. 1. The reforms actually mandated by Vatican II (including its modest concession of some vernacular in the liturgy), might - had it been culturally possible to implement them as envisioned - just might have been less traumatic and might have produced less of a rupture in Catholic culture. That the reform quickly went way beyond what Sacrosanctum Conclilium initially envisioned illustrates the inherent problematic of all reform. Change invites further change. It was the Council's chronological misfortune to occur on the eve of the civilizational revolution of the 60s, into which its reforms got completely swept up. 2. At the same time, it is absurd to blame the liturgical changes (or the post-concliar changes in general) for the post-conciliar problems of Catholic life. The revolutionary dynamic unleashed in the 60s swept everything before it. On the other hand, it is hard not to believe that the novel sense of the Church changing conttributed, to at least some extent, to a general loss of confidence within the Church. Almost overnight 1st-world Catholics seemed to lose confidence in their religious way of life and in the Church's mission to the world. Insofar as the changes in the Church (liturgical and other) added to the feeling that everything was now up for grabs, they helped facilitate the growing passivity in the face of secularization which was, of course, the very opposite of the spiritual renewal and evangelizing outreach the Concil had intended. 3. While much may have been lost liturgically by adopting the vernacular, much may also have been gained - everywhere, but especially (and here I echo John Allen) in places where the Church is actively competing with Islam. It serves no good purpose not to recognize the benefits of a more accessible liturgy (among them an expanded lectionary, concelebration, and the renewed rites of initiation). Nor does it seve any good purpose not to recognize the important values that were diminished in the process (reverence, transcendance, the sense that worship is about God not about us, and, notably, the Church's musical tradition). 4. The effort begun by Pope Benedict XVI to "reform the reform" by permeating the ordinary experience of the new liturgy with some of the best of the spirit of the old was a positive step, but it will remain extremely difficult to implement in our fractured and polarized world. 5. The long-term tragedy of the past 50 years has been the excessive turn inward, whihc has so distracted us from the Church's mission to the world (which both the Council in general and its liturgical reforms in particular were intended to equip the Church better for). Liturgy is where it all comes together and from which we then go out to witness to the world. As long as we are fractured and polarized liturgically, we will continue to have a hard time doing everything we need to be doing in the world. Every day, during these seven weeks we call the Easter season, the Church at Mass reads from the Acts of the Apostles – the evangelist Luke’s inspiring account of the growth and expansion of the apostolic Church from Jerusalem into the pagan Roman world (in the process transforming first the Church and then eventually even the Empire itself). Today’s excerpt [Acts 14:21-27] takes up the story of Barnabas and Paul at the farthest point of their first missionary journey, and follows them as they retrace their steps back to their original starting point, Antioch, where they had been commended to the grace of God for this work in the first place. (In other words, they weren’t freelancing, but were serving as ordained ministers of the Church.) Returning to Antioch, they now reported, not what they themselves had accomplished, but what God had done with them and how he had opened the door of faith to the Gentiles. In saying that, the apostles were not talking primarily about their physical ailments or any of the other ordinary difficulties that characterize daily human life, however significant such problems undoubtedly are. They were, rather, referring to the challenge of being transformed from one kind of person to another, the challenge of changing from one way of life to another, the challenge to be a new kind of person, the challenge produced in the present by the power of a radically new future that is already revealing itself in the Church. Such hardships, of course, include the opposition Barnabas and Paul encountered - and which the believers always encounter when the Church is doing its job in this interval between the old and the new, between Easter and the end. Talk about defining boundaries and setting the bar high! The community which Barnabas and Paul were constantly inviting people to join and were also actively appointing leaders for, that community was not some social club or mutual aid organization or exotic religious cult – although its attractiveness to people may have included elements of all those things. It was in fact a new way of being, unmistakably different from the way of being left behind in the world outside, left behind with Judas, and so unmistakably different that the outside world will get the point and be attracted to it! So it was not primarily that outside world, which Jesus talked to his disciples about at the Last Supper. His focus was rather on us, how we are to be here with one another – in that new heaven and new earth already taking shape in the present in his Church. Transformed by the Easter experience, our human solidarity in sin is being challenged by our new solidarity in Christ, through whom God really does dwell among us, making us a new people – breaking down what separates us from one another and our world and encouraging us to engage with one another and our world with new confidence. The invitation to embrace a new life within the new community of the Church does not mean pretending that the world has somehow totally changed, that everything old has suddenly disappeared, or that we are now unaffected by bad things that happen. It doesn’t even mean that the old, worldly, social distinctions between, for example, rich and poor, young and old, strong and weak, healthy and sick, citizens and non-citizens have somehow suddenly ceased to exist in the world. But it does mean that those distinctions have been downgraded in importance and that they have lost any ultimate significance here, with us, in the Risen Lord’s Church. Where do we find our identity – in wealth, health, social status, nationality? Or, first and foremost and ultimately, in the new and inclusive community of God’s people? Homily for the 5th Sunday of Easter, Immaculate Conception Church, Knoxville, TN, April 28, 2013. Somewhere along the way in the accelerated evolution of our language, "crossing a line" became the apparently preferred euphemism for doing something wrong. I suppose our post-modern abhorrence of objective morality makes it awkward to employ traditional moral language. But, of course, our judgmental, non-judgmental culture considers all sorts of things to be wrong (and rightly so in many cases). So some euphemism for moral judgment is required, and "crossing a line" seems to have become the preferred linguistic option. But, as all traditional moral language recognizes, not all wrongs are equal. Some wrongs are especially bad. Hence, the euphemism of the "red line." Thus, the Asad regime's suspected use of chemical weapons is more than just "crossing a line." It's "a red line" that is being crossed! So yesterday's news was filled with politicians and journalists all tiresomely repeating the same "red line" refrain! Whatever the line's color, however, it seems somewhat unclear what is to be done about it. That's the inherent difficulty with drawing lines of any kind, I suppose. When one does that and then the "line" is crossed, what is the right response? Bluffing works only up to a point. It's generally not such a good idea to threaten without a strategy to follow-up. The Syrian situation is immensely complicated and frought with dangers of all sorts. Creating uncrossable lines - arbitrary tripwires that can escalate a conflict - may only dig us a deeper hole, while we are still struggling to extricate ourselves from the holes we dug for ourselves in Iraq and Afghanistan. As with the rest of the so-called Arab Spring, it is not obvious that there are any good outcomes that are particularly likely. I do not know what the United State should try to do about Syria. I suspect I am not alone. So, iIn the absence of anything more serious, I guess we can expect more bluster about crossing lines! For centuries (until abolished by Paul VI in 1969), the "Greater Litanies," as they were known (in contrast to the "Lesser Litanies" on the Monday, Tuesday, and Wednesday before Ascension Thursday) were faithfully observed on April 25 - the "Rogation Procession" replacing the pre-Christian, pagan rituals previously associated with this day in ancient Rome. As I observed last year on this date, the switch from paganism to Christianity did not change pre-modern people's consciousness of their dependence on nature or their need for a successful harvest or the value of ritualizing those needs on traditonal days. At the time, I wondered whether our rationalized late 20th-century liturgy's eager abandonment of such reminders of our connectedness and dependence may perhaps not have been such a smart idea, after all. The use of the term “Greater Litanies” highlights the centrality of the singing of the Litany of the Saints in the traditional Rogation procession. The Litany of the Saints lends itself to lots of liturgical and devotional, uses especially in processions – most visibly recently in the procession of the Cardinals entering the conclave that elected Pope Francis this past March. In its traditional (pre-1969) form, the Litany has three parts. The first contains the actual invocations of certain saints from apostolic times through the late Middle Ages. The second part of the litany then enumerates some of the various ills from which we pray to be delivered - from all evils, sin, the wrath of God, sudden and unprovided death, the snares of the devil, anger, hatred, and ill will, the spirit of fornication, lightning and tempest, the scourge of earthquake, plague, famine, and war, everlasting death, and in the day of judgment. Then, in the third part of the litany, having acknowledged our neediness ("We, sinners, we beseech you, hear us"), we then specify some of those needs in a realistic mixture of petitions that combine our here-and-now needs with eternal ones - that the Lord spare us, pardon us, bring us to true repentance, govern and preserve his holy Church, preserve our apostolic prelate and all orders of the Church in holy religion, humble the enemies of the Church, grant peace and concord to Christian kings and princes, grant peace and unity to Christian nations, strengthen and preserve us in his holy service, raise our minds to heavenly desires, reward with eternal good all our benefactors, deliver us, our friends, relatives, and benefactors from eternal damnation, give and preserve the fruits of the earth, and grant eternal rest to the faithful departed. Of course, particular petitions reflect the specific circumstances of the time that got them included in the litany, but that's quite a comprehensive list. It specificity does not exclude other concerns but rather points us int he direction of comprehensiveness. It might seem pointlessly nostalgic to hanker for rogations processions, but there is nothing nostalgic or romantic about the neediness and dependence that motivated them and that are reflected and expressed in the petitions of the litany - neediness and dependence that remain at the heart of our human experience in a aoerld every bit as threatening and challenging as it was to our ancestors.. Wealth corrupts, and the greater wealth the greater the corruption. One of the more corrupting influences of wealth is the inordinate sense of entitlement that accompanies it - something that is especially strong in a society such as ours that caters so shamelessly to the rich. Entitlement means one feels one deserves better treatment than other, ordinary mortals. Now rich people and business travelers are typically treated better than other, ordinary passengers on planes. But there is one area where all passengers are equal - flight delays. It just doesn't matter how rich one is or how much one has paid, if the plane can't take off on time. Everyone has to wait. and nobody - even poorer travelers like me - likes having to wait. We all resent it. So there is a part of me that shares the anger of those complaining about the increasing travel delays, thanks to cutbacks caused by the infamous sequester. That part of me wouldn't mind so much if the Republicans who saddled us with the sequester in the first place decided to find a way to fix this particular consequence of their misguided policy. After all, everyone - at least everyone who flies planes or who is depending on others arriving on time - would benefit. On the other hand, there are far worse consequences to this misguided obsession with the deficit and cutting government spending - not least for the poorest among us, whose sufferings as a result of budget cuts will not generate comparable sympathy in the halls of power as will the inconveniences experienced by the rich. A stupid policy that inconveniences the rich as well as the poor could, of course, be corrected in a way that equally honored everyone's pain. But what could be more counter-cultural than that? If those screaming about flight delays successfully pressure their representatives in Washington to fix their problem, those unrepresented in Washington will likely continue to suffer. Sequestration should be repealed rather than amended. But the more likely result will be yet another triumph of entitlement. I was in the UK on July 7, 2005, when terrorists attacked the London Underground. I was at Windsor Castle, where I was part of a summer clergy program sponsored by St. George's house. The group picture of my classmates with the canons and staff that hangs on my office wall was taken that day - our happy smiles in stark contrast to the tragic news we learned just a few minutes later. I was obviously quite safe where I was - in the Queen's Castle surrounded by HM's guards, but security was heightened and I could feel the anxieties of others for whom London was not just a nice place to visit but home - a feeling I could easily relate to having lived throough the 9/11 terrorist attack on New York five years earlier. The thing about the London bombings that made such an impression was that the Islamic terrorists were in fact British, members of immigrant families who had lived, gone to school, worked, whatever in Britain. They weren't, as the 9/11 terrorists were, foreigners in every significant sense. And that's why I am recalling that event and the reaction to it light of our own most recent episode in Boston where two young men who had been brought to the United States when they were younger and who had apparently assimilated well (one of who is in fact an American citizen), but who, after living among us, got religion and turned against us. What causes a seemingly assimilated American teenager to become devout and turn against his adopted country? At a funeral recently, the singer sang a song with the refrain "there's a family tree surrounding me." It was beautiful expression of the power and importance of family, which remains the supreme reality in life for most people. The bonds of common citizenship are sometimes likened to family ties. To some extent, civic life is a kind of family writ large, a bond that is intended to unite us around our highest earthly loyalties. Historically, the United States has done a very good job - much better than European countries, for example - of integrating all sorts of different people from differing nations, races, cultures, and religions in a common civic culture. For America to remain the exceptional society it always has been, it must continue to be able to do that. History, as Blessed Pope John XXIII is supposed to have said, is the greatest of teachers. So it is no accident that the bulk of the Bible – both Old and New Testaments – is history of one sort or other. And so it is also that every day of these seven weeks we call the Easter season the Church reads from the New Testament book called the Acts of the Apostles, actually the second volume of Luke’s Gospel, his continuation of the story of Jesus in the history of the Church. Acts tells the amazing story of the Church’s growth, of the gradual but definitive expansion of its membership and the widening of its mission as the Good News spread – first in Jerusalem, then through Judea, then in to Samaria, and eventually into the Greek-speaking, pagan world of the Roman Empire. All this took place not by happenstance, but as part of God’s long-term providential plan – as Saint Paul makes clear quoting Isaiah in today’s 1st reading [Acts 13:14, 43-52]: I have made you a light to the Gentiles, that you may be an instrument of salvation to the ends of the earth. We get some sense of what that is supposed to mean from the Book of Revelation’s vision of the heavenly liturgy [Revelation 7:9, 14b-17], with its great multitude which no one could count, from every nation, race, people, and tongue. But how do we get from here to there? Getting from here to there – that’s the mission of the Church and the history of the Church, modeled for us in the Acts of the Apostles. It’s called the Acts of the Apostles, but after the first few chapters most of the original 12 fade from center stage. Paul (who wasn’t one of the 12 and who never knew Jesus during his earthly life) eventually emerges as one of the central figures in the history of the Church’s growth and expansion. Perhaps that had something to do with the fact that Paul was bi-cultural and bi-lingual – a Jew from a Greek city (and a Roman citizen besides). In any case, Paul’s conversion to Christ has been so complete that it compelled him to share Christ with everyone. Paul recognized in the Risen Lord the fulfillment of God’s promise to Israel and God’s plan to include all people in eternal life. Since it was ultimately Christ who counted, Paul saw no conflict between being a Gentile and having faith in Jesus – thus making it possible for the Gospel to be really Good News for all. The world has changed a lot since Paul’s time, but the Church’s mission hasn’t. There is always a temptation to turn inward, to become a cozy kind of community, caring a lot about ourselves, concerned with who we are and what we have together. But the mission of the Church, our literally quite Catholic mission, remains that of the Good Shepherd, whose voice in the world we now are – we, who have been commanded, as Paul was, to be an instrument of salvation to the ends of the earth. On this 50th annual World Day of Prayer for Vocations, we are also reminded of what we might call the “personnel needs” of the Church for it to fulfill its mission of making the Good Shepherd’s voice heard in today’s world. The wonderful story Acts tells of the growth and expansion of the Church needed people like Paul and Barnabas to respond to the Risen Christ’s invitation to full-time involvement in the mission – even at the risk, as Acts acknowledges, that such a life might put one at odds with prevailing cultural and societal trends. All the more reason, therefore, why it is so necessary for all of us to be always ready to respond filled with joy and the Holy Spirit to the challenge of God’s call – whatever in particular it may be in our individual lives – and ever on the alert to identify, encourage, and support the Pauls and Barnabases of our day, who may be right here in our community today and whose energy and commitment will be needed if the Good Shepherd’s voice is to continue to be heard in our world. Homily for the 4th Sunday of Easter (50th Annual World Day of Prayer for Vocations),, Immaculate Conception church, Knoxville, TN, April 21, 2013. During the Second Vatican Council, Pope Paul VI designated “Good Shepherd Sunday” (at that time the 2nd Sunday after Easter), as a World Day of Prayer for Vocations. This Sunday, this year, marks the 50th annual such World Day of Prayer for Vocations. “The problem of having a sufficient number of priests”, Pope Paul stated at the time, “has an immediate impact on all of the faithful: not simply because they depend on it for the religious future of Christian society, but also because this problem is the precise and inescapable indicator of the vitality of faith and love of individual parish and diocesan communities, and the evidence of the moral health of Christian families. Wherever numerous vocations to the priesthood and consecrated life are to be found, that is where people are living the Gospel with generosity” (Radio Message, 11 April 1964). A lot has happened in the intervening half-century that neither Pope Paul, nor the Council Fathers, nor anyone else anticipated. One of the great blessings the post-conciliar experience has been the great growth and expansion of the Church in so much of the world, which has made the Church truly universal to an unprecedented degree. That universality has received further recognition and visibility this year in the election of the first Latin American Pope, the first Pope from the so-called “Global South,” and the first non-European Pope in over 1000 years. (The Pope himself will observe tomorrow's World Day of Prayer for Vocations by officiating at the ordination of new priests in St Peter's Basilica.) At the same time, while growth and expansion have been happening elsewhere, here in North America (and even more so in Europe) the Church has encountered unexpected new challenges, all of which are making the promotion of vocations to ordained ministry and to religious life that much more urgent. The annual observance of this World Day of Prayer for Vocations is intended to highlight the importance of such vocations in the life of the Church and to encourage all of us – whatever our individual calling in life – to encourage and promote religious vocations in our personal prayer and in our parish’s pastoral action. It is, therefore, an urgent responsibility of the entire Catholic community to care about vocations both for the service of our local Churches in the United States and for the service of the Universal Church throughout the world. Obviously, helping potential priests, deacons, and religious men and women to sort out how best to follow God’s call must be a common concern of all. When he was a twenty-something himself, Servant of God Isaac Hecker wrote: “Happy are they who find out in their youth what all men discover at some period of life, that god, and God alone, can satisfy the inmost wants of the soul, and who consecrate themselves to His service with all the freshness and purity of their youthful energy” (From a letter written by Fr. Hecker while a Redemptorist novice, St. Trond, Belgium, 1846). If for a brief fleeting moment a bipartisan compromise to expand background checks for gun purchasers gave the illusion that grown-ups were taking charge in Congress and that maybe some modicum of rationality might prevail, that illusion was shattered yesterday with one of the Senate's most shameful votes in its less than stellar history. Procedurally, the vote highlighted the continued scandal of the institution of the filibuster - especially in its current incarnation, no longer an occasional event in which "a small band of willful men" (in Woodrow Wilson's famous phrase) talk till the clock runs out, but a routine, passive acceptance by the majority of a minority's will to stifle democracy without even having to go through the inconvenience of having to talk! Substantively, it highlighted the moral bankruptcy of a society saddled with the curse of constitutionally protected private gun ownership. None of the legislative measures proposed or considered would have ended or even seriously limited our fundamental national illness of private gun ownership. A rational society would long ago have recongized that the Second Amendment is at best an obsolete anachronism. States no longer need to rely on citizens' militias to defend their communities against Indian attacks or the threats of neighboring British or Spanish colonial empires.The Second Amendment no longer serves the defensive purpose for which it was created. Instead, thanks to injudicious judical interpretations it has been transformed into an anti-social monstrosity. The only rational response would be to repeal the Second Amendment and allow reasonable legislation to be crafted that responds to the exigencies of civilized life and the circumstances of the 21st century. None of that is ever likely to happen, of course. Every society has aspects which warrant being ashamed of. This is a big one. Modern pilgrims in Israel can quickly sense the contrast between the dry, dusty desert of Judea (where Jerusalem is) and the relatively lush, green of Galilee (where today’s Gospel story [John 21:1-19] is set). Renewed annually by winter’s life-giving rains, the land around the large lake the Gospel calls the Sea of Tiberias (more commonly called the Sea of Galilee) is at its lushest and greenest in spring. And so, it was to that place at this season of the year, that Peter and six other disciples returned. It had been from those familiar shores that Jesus had originally called them to follow him. Now they’d come home – back to what they knew best. They went fishing. But this was to be no normal fishing expedition! There’s a lovely little church on the shore that marks the supposed site of this event. In front of the altar is a rock, traditionally venerated as the stone on which the risen Lord served his disciples a breakfast of bread and fish. Staples of the Galilean diet, bread and fish seem to be staples of the Gospel story itself! Just a short walk away is another church, marking the site where Jesus had (not so long before) fed 5000+ people with five loaves and a few fish. Presumably, the disciples would have well remembered that earlier meal. And surely we should as well, as we also assemble here at the table lovingly set for us by the risen Lord himself. Here, in this church on this hilltop, as surely as on that distant lakeshore, he feeds us with food we would never have gotten on our own. Here too he challenges us, as he challenged Peter, with the question: do you love me? Peter was asked this critical question three times – obviously corresponding to the three times Peter had earlier denied Jesus. It’s as if – as one of our local Protestant pastors put it recently – as if Jesus were giving Peter an alternative set of memories, his triple profession of love replacing his triple denial. Later in the story, we learn that another disciple was following Jesus and Peter as they walked along the shore. This conversation initially concerned primarily just Jesus and Peter; but, listening in with that other disciple, we learn that what started out as a fishing story has now turned into a shepherding story. This mission of Peter and of his successor, the Pope, has been very much in the news these past two months, beginning with the resignation of Pope Benedict XVI and continuing with the election of Pope Francis, who just last Sunday formally took possession of the Lateran Basilica, the cathedral church of Rome, ceremonially signifying his office as Chief Shepherd of the Church, commissioned to tend Christ’s flock in the world. Typically, in these gospel stories of the risen Lord’s appearances to his disciples, there is the sense that, while this is certainly the same Jesus the disciples had followed in life and who had died on the Cross, something about him is now different. Hence, the dramatic moment when Jesus is recognized, as when the disciple whom Jesus loved said to Peter, “It is the Lord!” But recognizing the risen Christ is not the end of the story. It is but the beginning of a life lived in love, in a community of love. We learn that love by following the risen Lord. So, even before being formally entrusted with his special mission, Peter leads the way, dressing up for the occasion, jumping into the sea and swimming to Jesus ahead of the others. As his role requires, Peter here is already leading his flock, leading here by example. His example illustrates for the rest of us what it means, first, to recognize the risen Lord and, then, actually to follow him. Learning love is a lifelong process. So it was for Peter, as Jesus’ concluding words to him made clear – just as his words also make clear for us that we learn by doing, by following. If we keep Christ in the closet, confining him to at most only a corner of our lives, if we do nothing to bring his risen life anywhere to anyone else right here and now in the basic bread and fish of ordinary life, then well may Jesus have to ask each of us over and over again, do you love me? And so, after everything else has been said, Jesus says to us, to each of us in his or her own way of life, in his or her particular role and vocation in the Church, just what he said to Peter: Follow me! Homily for the 3rd Sunday of Easter, Immaculate Conception Church, Knoxville, TN, April 14, 2013. 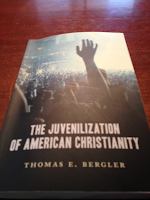 If Patriarch was this week's fun reading, my more serious recent reading was Thomas E. Bergler's The Juvenalization of American Christianity (Eerdmans, 2012), a study of how, in the 20th century, different denominations approached youth ministry and the impact that adolescent culture had on the larger Church. The author himself has taught courses on youth ministry and is one of the editors of something called The Journal of Youth Ministry. So one presumes he knows what he is talking about. His analysis of the American Cahtolic community during the period at issue certainly rings true. So I assume he is equally accurate in his history of the Methodists and othersduring the same period. Bergler sets the theme of his book in his initial definition. "Juvenallization is the process by which the religious beleifs, practices, and developental characterisitcs of adolscents become accepted as appropriate for Christians of all ages. It begins with the praseworthy goal of adapting the faith to appeal to the young. But it sometimes ends badly, with both youth and adults embracing immature versions of the faith." Thus the book is obviously not a broadside against youth ministry per se or even particularly prevalent styles in youth ministry as such. Rather it is an analysis of what one might call the unintended consequences of a cultural transformation. And it is, of course, a culture-wide transformation. So, for example, in his opening description of "a typical middle-class Americna church," he notes how "people are dressed less formally than they will be when they go to work on Monday morning." Lamentably true as that may be, it is also - and increasingly - the case that people dress pretty informally on Monday too. The Churches may perhaps be faulted for not having more strenuously resisted all sorts of dubious cultural changes, but the fact is that the larger culture has been moving in the direction of a less adult approach to life and work and everything else for quite some time. The Churches have certainly been a part of that but hardly the sole agents of it! Still, his concern, of course, is the impact of all this on religious faith and religious institutional life. He recognizes that thriving congregations are typically those that invest in youth progams. Considering the continued growth of white Evangelical Churches,he says they "are the ones that look most like the successful youth ministries of ther 1950s and 1960s." He is all for Churches effectively reaching out to youth in ways youth can relate to. The challenge he poses, however,is for the Churches "to teach what the Bible says about spiritual maturity, with a special emphasis on those elements that ar eneglected by juvenalized Christians." In summary, his overall analysis of the impact of the "juvenalization" proces on the state of American religion is this: "White evangelicals invested heavily in young people and aggressibvely adapted to their preferences for an informal, entartaining, feel-good faith. They ended up with churches full of Christians who think that the purpose of God and the Christian faith is to help them feel better. Liberal Protestant youth leaders seriously misjudged the cultural tastes of young people and underestimated how much effort it woudl take to form countercultural social activists. They ended up with aging congregations and declining numbers. Roman Catholics were slow to juvenalize their churches and invested less in the spriitual formaiton of youth than they had before the crises of the sixties. They ended up with thousands of nominal Catholic adherents with relativley low levels of religious knowledge and commitment." Naturally, I found his analysis of Americna Catholic life especially interesting to mer personally. In a chapter suggestively titled "Why Everyone Wanted to Get out of the Catholic Ghetto," he describes how successful the Catholic Church was in the period 1945-1965 in creating a unified, cohesive set of Catholic institutions, which then unexpectedly fell apart. "The young Catholics of this era were much better educated avout their faith and practiced it more faithfully than Catholic teenagers today," he acknowledges. He then notes that "these same young people later repudiated what they called the 'Catholic ghetto.' And in some ways, the American Catholic church has yet to recover from the chaos and confusion that resulted from the collapse of its 1950s system of spiritual formation." As someone who grew up a Catholic during that period and was deeply formed in and by it, I really resonated with his account. Bergler quotes Garry Wills (back before Gary Wills became an angry, embittered, Catholic-basher) that "It was a ghetto undeniably. But not a bad ghetto to grow up in" (Bare Ruined Choirs, 1972). The book is well worth the read just for its effective evocation of that long-long past - and for the lesson of how such a comprehensive and successful system of spiritual formation could ultimately fail and completely collapse. While "Catholic education helped young people develop critical thinking skills and gave them a rich moral and theological terminology that was stronger than most anything being offered to young Christians of any stripe today," it did not counteract the desire for a "normal" American middle-class life. Nor did it prepare Catholics to reach youth effectively in the absence of "a dense network of mutually reinforcing institutions." And, on top of everythign else that went wrong in the Catholic Church in the 1960s, "there was a sudden collapse in adult investment in youth work." The lesson to be learned from the Catholic expeirence is how dependent the succesful 1945-1965 Catholic culture was on that "dense networkd of mutually supportuing institutions." As the larger society's structures that had hitherto been so supportive suddenly collapsed, the internal Catholic ones, it turned out, weren't up to the job anymore either. "The Catholic ghetto had produced dramatic results with only a superficial juvenalization that had not conceded much to the deeper trends in youth culture. As a result, Cahtolic youth leaders had little practice in creatively appealing to young people who were no longer forced to attend their programs and who were less and less likely to believe something just because a religious authority figure said it." It sounds like the age-old problem ancient Israel faced when the people opted for normalcy over specialness - asking for a king as other nations have (I Samuel 8:5)! I've just finished David Nasaw's 800 pp. biography of Joe Kennedy - The Patriarch: The Remarkable Life and Turbulent Times of Joseph P. Kennedy (Penguin, 2012). In his Introduction the author indicates his desire to situate the popular image of Kennedy as "an appeaser, an isolationist, an anti-Semite, a Nazi sympathizer, an unprincipled womanizer, a treacherous and vengeful scoundrel," etc., in "a larger, grander, more complicated history." Admittedly, we are all complicated characters, and the personal Kennedy story is only of interest as part of the complicated history of the first two-thirds of the 20th century. Unfortunately deprived by history and our constitution of the benefits of having real royalty, Americans have learned to live with celebrity faux royalty, of whom the most prominent have obviously been the Kennedy family. And that clearly accounts for our continuing interest in all things Kennedy. And virtually everything Kennedy goes back to Joe, whose fantastic wealth and obsessive ambition for himself and his sons set it all in motion. The general outline of Kennedy's story is familiar enough - especially to those of us above a certain age who remember when Kennedy wealth and ambition had a major impact on American politics and history. The story has several strands. There is the Boston Irish story. There is the successful businessman story. There is the appeaser Ambassador story. And there is the family story. It is the latter which is the connecting link through it all. The heir of a wealthy Boston-Irish political family, united by marriage with another wealthy, prominent, Boston-Irish political family, founded a moneyed political dynasty energized by intense, seemingly unlimited ambition. Kennedy was a devoted father, and everything we have heard from his children over the years clearly confirms the image of him as the loving father who motivated his children and enabled their own ambitions. Parental love is generally speaking a good thing, of course. Prescinding from the complicated case of the unfortunate Rosemary, it cannot be denied that the other eight Kennedy children experienced their father as a genuinely loving, affirming force in their lives (albeit at times a controlling and demanding one). So much of what Kennedy did - including what he did wrong - can be blamed on his devotion to and ambition for his family. As FDR perceptively observed, what Kennedy cared about above all was preserving his fortune for his children. "Joe," FDR observed, was "terrifically spoiled at an early age by huge financial success; thoroughly patriotic, thoroughly obsessed with the idea that he must leave each of his nine children with a million dollars apiece, when he dies" and "had a positive horror of any change in the present methods of life in America." But the crucial lesson Joe Kennedy's tragically ambitious life highlights is the corrupting character of wealth - a not insignificant lesson today as our society seems increasingly to value wealth above all else. It was Kennedy's wealth, after all, which gave him his independence and facilitated his ambition. It was his wealth which made him a figure to be reckoned with, whom even FDR had to cater to. But it also enabled him (in the bad sense). It enabled him not to have to learn how to subordinate his will and his ambition to anything larger than himself and his dynastic concerns, to learn to use his admitted intelligence and talents for anything bigger than. himself and his dynastic concerns. Commenting on Kennedy's dramatic failure as ambassador, Nasaw writes: "Joseph P. Kennedy had battled all his life to become an insider, to get inside the boston banking establishment, inside Hollywood, inside the Roosevelt circle of trusted advisers. but he had never been able to accept the reality that being an 'insider' meant sacrificing something to the team. His sense of his own wisdom and unique talents was so overblown that he truly believed he could stake out an independent position for himself and still remains a trusted and vital part of the Roosevelt team." Two very different women died this week, both of whom in some sense symbolized different eras and influences in my lifetime - Anette Funicello, whom I happily remember as one of the most popular of the original Mousketeers on the 1950s TV show The Mickey Mouse Club, and Baroness Margaret Thatcher, Prime Minister of the United Kingdom from 1979 to 1990. Margaret Thatcher was the longest serving 20th-century British Prime Minister. Normally, that might be the factoid forever mentioned first in her regard. Giver our obsessive current cultural and political fixation on gender, however, it is no surprise that what is usually mentioned first is that she was Britain's frist - and so far only - female Prime Minister. But she was also the first scientist Prime Minister (having studied chemistry in college). And she was certainly the most resolutely middle class person to lead Britain's conservative party. Being a woman undoubtedly counted against her in her unexpected rise to power, but being "a grocer's daughter" was at least as, if not more, significant - a class background that until then would have made her a wildly improbably candidate for party leadership. Nortwithstanding our contemporary fixation on gender and other such identities, I think class remains the most determinative identity in terms of most people's life prospects and opportunities. Being a woman did not, at least as far as I am aware, significantly dictate her policies. (She certainly eschewed an feminist agenda). But being middle class most certainly did make a difference. Thatcher brought to politics a strong - indeed extreme - version of bourgeois individualism, which had little patience with left-wing collectivism and just as little patience with right wing, traditonalist, aristocratic communitarianism. Indeed, one of her most infamously memorable lines was "There is no such thing as society." Thatcher was an accomplished politician, who (whether for better or for worse, or more likely for both) accomplished an extensive transformation of British society and British political culture. She was also an important force internationally. She stood up to Argentinian agression, after the Argentine military dictatorship invaded the Falkland Islands. Conventional wisdom at the time downplayed the feasibility of resisting aggression and counseled negotiation. But Thatcher, to her lasting credit, marshalled her forces and liberated the Falklands. On the larger international stage, she led the way in appreciating that a new generation had come to power in the Soviet Union with Gorbachev, and that he was someone that the West could - and should - do business with. Regarding Gorbachev, US Presidents Reagan and Bush followed her lead, and in due course the Soviet Union was no more. Thatcher's domestic record is clearly mixed. In important respects, Britain is in certain ways better off now than it was in 1979. But those benefits have not come without a significant price in terms of inequallity and social fragmentation. (Of course, if one believes "there is no such thing as society," then undermining social unity and harmony may not appear problematic!). One of my Marxist professors, way back when I was an undergraduate (before Thatcher came to power), liked to say that capitalism solves the problem of production and socialism solves the problem of distribution. But the larger problem, as history has shown, is that neither one alone seems able to solve both problems. Yet both problems need to be addressed. Socialism fails if it produces insufficient wealth, if everyone ends up equally poor (except of course for the party elite). But capitalism fails - morally as well as economically - if, as has happened before and seems to be happening again now in our own society, the wealth produced increasingly benefits only a smaller segment of society, while the middle class stagnates and declines. Unfortunately, both those old ideologies are basically bankrupt today. The American Right worries that the rich are not quite rich enough and fears that the rest of us non-rich might get too much health care! The Left, on the other hand, cares much more about gender and identity politics and waging cultural war than with correcting economic inequality. Lady Thatcher was right about some things and wrong about many others. But at least the issues she fought about were important ones. One week ago, on Easter Sunday, we celebrated the resurrection – a real, historical event, but one which no one witnessed first-hand. What was witnessed initially was an empty tomb – a necessary condition, of course, for any claim about Jesus’ resurrection to be true, but hardly sufficient confirmation of it. Tombs can be empty for all sorts of reasons, and the immediate result the empty tomb produced among Jesus’ friends and followers was confusion. Something more had to happen; and something more did happen when the risen Lord himself appeared to his disciples, demonstrating that the same Jesus who had lived and died was now alive again in a gloriously new way. The gospel we just heard [John 20:19-31] recounts two such appearances – the first on Easter Sunday itself, the second one week later (that is, today). Understandably still fearful for their safety, the disciples had hidden behind locked doors. Perhaps their hiding place was the same “Upper Room,” where they had so recently celebrated the Last Supper and where they would soon assemble again after Jesus’ ascension to await his promised gift of the Holy Spirit. If so, that would be very appropriate, wouldn’t it? Since the time of the apostles, Sunday, the first day of the week, has been the special day, the privileged day, when the risen Lord’s followers everywhere meet in their churches to experience the risen Lord’s power, present through the power of the Holy Spirit in the sacramental celebration of the Lord’s Supper, the Eucharist. And it was on Sunday, the Lord’s Day as John calls it, that (as we just heard [Revelation 1:9-11a, 12-13, 17-19]) John in exile on Patmos experienced yet another vision of the risen Christ, once dead but now alive forever and ever. Like Thomas, we were not there that first Lord’s Day, but we are here today, on this Lord’s Day. With Thomas, we too are invited to believe and so to experience the peace that flows from the wounds of Christ. For the same God who raised Christ’s wounded body from the tomb has, by the gift of his Holy spirit, brought into being a Church, which is Christ’s body in the world, with all its wounds. And we, who have been united with the risen Lord in his Church are the same fearful, wounded individuals who first came to Jesus for mercy and peace – not unlike the many who carried their sick and disturbed to shelter in Peter’s shadow [Acts 5:12-16]. The risen Christ incorporates us all in his Church, just as his resurrected and glorified body still retains his original wounds. Those wounds, which confirmed for the disciples the connection between Jesus’ earthly body and his risen body, confirm for us the connection between our ordinary earthly lives (wounded in so many different ways) and our new lives as members of Christ’s Church. Homily for the 2nd Sunday of Easter (Divine Mercy Sunday), Immaculate Conception Church, Knoxville, TN, Saturday, April 6, 2013. Of Rome's great papal basilicas, the Vatican Basilica, St. Peter's, gets the most tourist attention. Among Romans, the "Liberian" Basilica of Saint Mary Major on the Esquiline Hill is said to be the most locally popular. Yet primary among them in rank, and senior to them all in age, is the Lateran Basillica, the Archbasilica of Our Savior, more commonly called St. John Lateran, which enjoys the status of Rome's "cathedral" church and hence has inscribed on its facade Omnium Urbis et Orbis Ecclesiarum Mater et Caput ("Mother and head of all the Churches of the City and the World"). Accordingly, tomorrow, the new Bishop of Rome, Pope Francis will formally "take possession" of his cathedral church. Actually, as Bishop Luca Brandolini, Vicar Capitular of the Lateran Basilica, pointed out in a recent interview, tomorrow’s celebration is really not so much about "taking possession" but is rather better (and more traditionally) understood in terms of the ancient rite of "enthronement on the Roman Chair." The Bishop’s Chair (cathedra) is the sign of a Bishop’s teaching office and ministry as pastor of a particular church and is what specifies a cathedral as opposed to any other church (e.g., your ordinary parish church). Accordingly, the Cathedral Chair of Rome represents the Bishop of Rome’s teaching office and ministry as pastor – first of all, of course, in Rome itself, but also (as a consequence of the unique relationship between Rome and the Apostle Peter and the Bishop of Rome’s role as Successor of Peter) the Pope's unique and necessary teaching office and ministry as universal pastor for the whole Church. As Bishop Brandolini noted, tomorrow’s celebration “spotlights the exquisitely ecclesiological root, placed by the providence of God, in the Church of Rome, from which springs, in fact, the Petrine ministry.” In short, it expresses ritually the unity of the Church across time and space through the Bishop of Rome's unique connection with Saint Peter and the communion of all the local Churches with each other through their common connection with the Church of Rome. Across the piazza from the Lateran is a modern statue of St. Francis of Assisi and his companions, representing their joy as they caught sight of that venerable church - the same church which Pope Innocent III in his dream supposedly saw Francis holding up to prevent its collapse - another obvious symbolic identification of the Church of Rome with the Universal Church. The Lateran ceremony will be shown on TV tomorrow at 6:30 p.m. EDT. Well, the doctor didn't actually order it. But he did agree with my suggestion that it wouldn't hurt for me to fly up to New York for a few days of rest and renewal as soon as an appropriate opportunity presented itself. And so that's what I did the day after Easter. 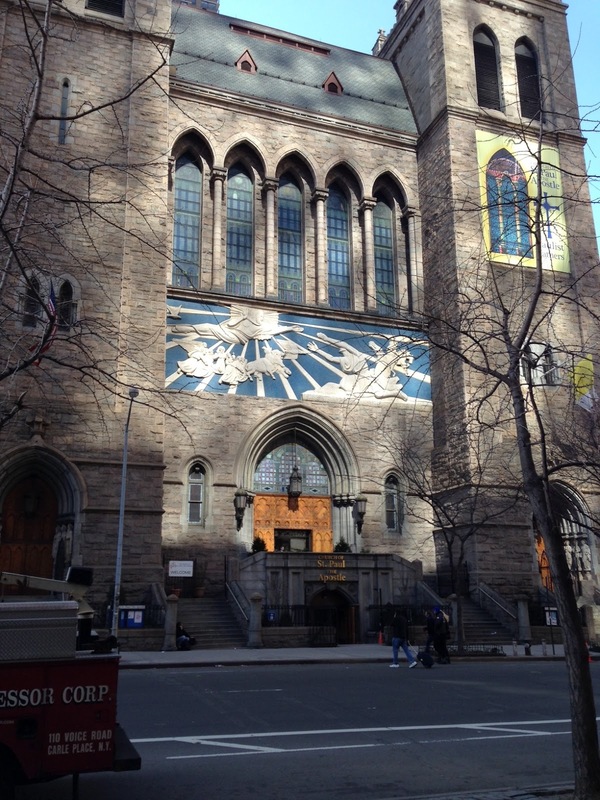 It's been a refreshing four days - just "hanging out" at the Paulist Mother Church in midtown Manhattan and reconnecting with a few old friends. On Wednesday morning, I even made it to join my old Wednesday Breakfast group for breakfast at the famous Flame Diner at 58th and 9th! It has been a very short trip. So there were obviously a lot of people I might have wanted to see that I just didn't see. In summer, when I will have more time off and will be less focused on just doing nothing for a few days, there will be that much more time to catch up with many more people. As everyone knows - at least since Aristotle said it, and presumably long before he said it - friends are an absolutely essential element of any happy life. Whenever I get back here, however short the visit, I am reminded what an absolute treasure friends are - and how humanly important it is to keep in serious contact with one another. In Italy, Easter Monday is called Pasquetta ("Little Easter"). Easter Monday is still a legal holiday in several countries - making it a sort of socio-civic prolongation of the great Easter festivity before everyone resumes the routine of the regular work week. In past centuries, Easter Monday was also widely observed in the Church as a holyday of obligation (and still is, I believe, in Germany). 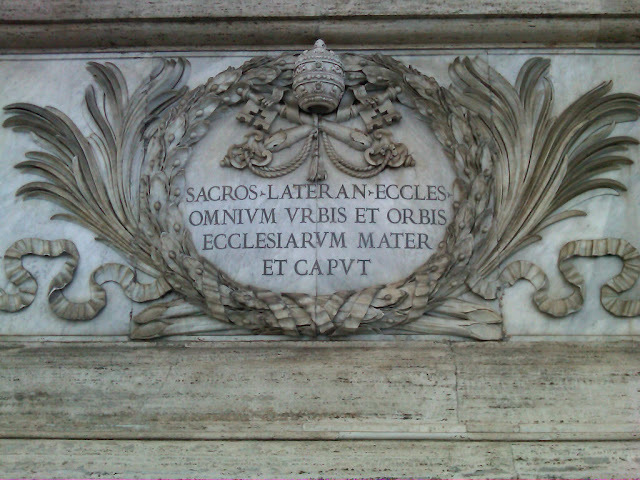 Its ancient importance is suggested by the assignment of St. Peter's Basilica as the stational church for today. In the traditional (pre-1970) liturgy, today was one of the days (together with tomorrow and Saturday) when the Paschal Candle was supposed to be lit this week. Something about the style and pace of modern life makes it a challenge to sustain solemnity. Overall, I think we're better at building up to festivity than at prolonging it. That makes the Easter Octave - and actually the whole seven-week Easter season - something of a challenge. When I was a kid, Catholic schools routinely closed all of Easter Week. So it was easy to get into the mindset of Easter Week as vacation time. That may do something of a disservice to the liturgical calendar, but it may be beneficial in other ways. "Celebration," one of the priests on the formation team when I was in seminary once said, "takes work." Certainly, celebrating the solemn ceremonies of the Easter Triduum in smaller churches can sometimes seem like a lot of work, and can easily leave one simultaneously both exhilarated and exhausted as a result! Personally, I felt that combination in myself as I finished up at church and headed home for my solitary Easter afternoon. 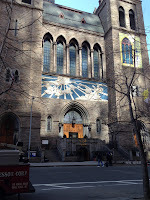 So, having celebrated the Church's liturgy this past week with all the solemnity I could muster, I am now planning to observe Easter Week this year by taking off today and the three days following for some (hopefully restorative) rest and catching up with friends in New York. A blessed Easter Week - and Easter season - to all!